This is the age we live in. Yes, it's anti-Catholics nutjobbery. But I'm not even focusing on that. Is this what passes for art nowadays? That's the thing. Art is just p.r. nowadays. It has nothing to do with skills or talent. It's just pick the right enemy and make a big splash. It's blog-whoring essentially. It's all about the art of getting noticed. But the thing that's worst about it is that it's soooooooo boring. It's always punching down. It's always siding with the mainstream over those deemed to be not mainstream. It's always the same tired anti-Christian, anti-conservative pablum. When people say art is dead, this is what they mean. 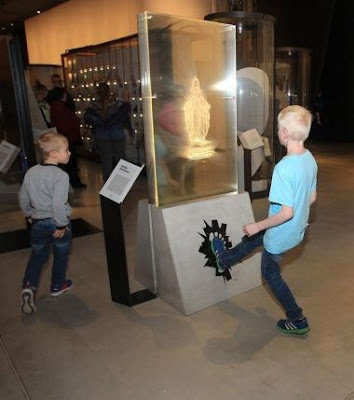 An image of the Virgin Mary in a museum in Estonia, designed to be desecrated to commemorate the Protestant Reformation, has provoked protests from religious and political leaders. The exhibit in the recently-opened National Museum of Estonia, in Tartu, is part of an exhibition on the Reformation in Estonia. It shows a virtual image of Our Lady of Graces on a screen in a glass box. If visitors kick a marked spot on the plinth supporting the box the image shatters into pieces and is replaced by the word “Reformation”. The screen then refreshes. The museum’s Facebook page says the exhibit is an “artistic representation of the theme of iconoclasm”. Archbishop Urmas Viilma of the Estonian Evangelical Lutheran Church said that the exhibit ridicules religion and insults the feelings of believers. This is straight up anti-Catholic nutjobbery.